My collection includes simple circular and semi-circular protractors ranging from small celluloid school ones to a massive twelve inch one. 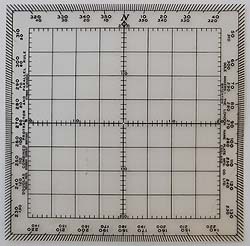 There is also a variety of rectangular protractors in ivory, boxwood, brass and plastics. I also have a number of circular and semi-circular vernier protractors, some of which are shown on the Major Maker’s pages. 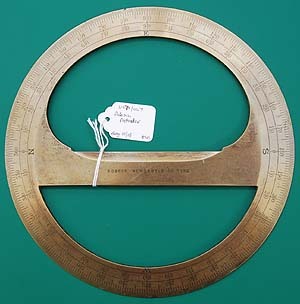 Six inch rectangular ivory protractor by J Dunn of Edinburgh. Dunn was working from 1824 to 1841. An ivory, rectangular protractor by Robert Brettell Bate, Poultry, London. He was working from 1808 until he died in 1847. These protractors were frequently included in sets of drawing instruments. A nineteenth century, four and a half inch, boxwood protractor, probably from a pocket set. 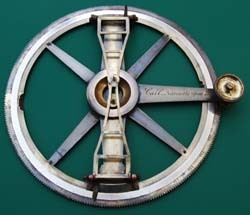 Six inch boxwood protractor from the James Parkes of Birmingham set of patent drawing instruments. Circa 1900. 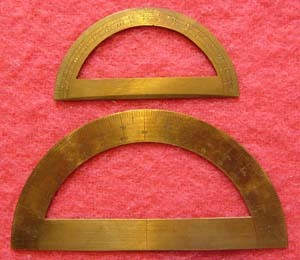 Two brass protractors. The upper, four inch, one is finely chamfered and hand engraved and would have come from a c1800 pocket case. The lower, six inch, one is thin sheet brass, also hand engraved, probably c1900. This opaque, celluloid?, protractor dates from about 1920. An eight inch lacquered brass circular protractor dating from about 1900. This would probably originally have had its own mahogany case. 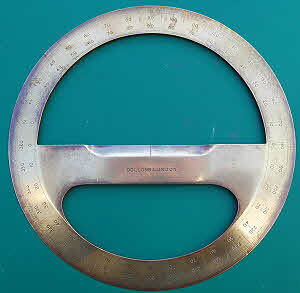 A twelve inch, nickel silver plated brass, semi-circular protractor by Dobbie Son & Hutton of London. 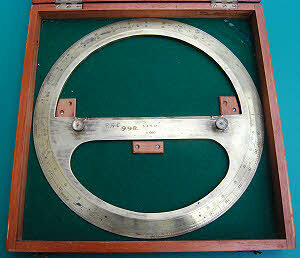 This heavy protractor also dates from about 1900. Protractors this large are rare. A Russian, nickel plated brass , seven inch protractor with extended scales and also diagonal scales on the base. It has a cloth covered and lined case. Probably mid-twentieth century. 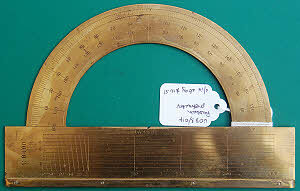 A heavy brass, six inch, vernier protractor by Troughton & Simms dating from the nineteenth century. It is housed in a fitted mahogany case and is complete with two screw-in points for holding it in position whilst plotting angles. Theo Alteneder eight inch, stainless steel, vernier protractor, mid twentieth century. It has a velvet lined case. 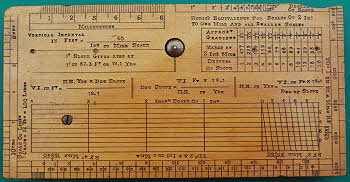 Brown & Sharpe steel draftsman’s protractor, early twentieth century. A 1940s celluloid and japanned brass station pointer in its fitted wood case. The station pointer is a navigating instrument which can be used to plot ones position from angles measured between landmarks with a sextant. This one was possibly a training instrument. They are usually more heavily constructed, from brass or bronze. 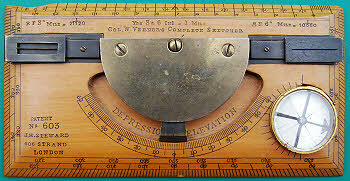 This protractor, by Harling, is from the Woolwich pattern military set and has elevation scales on the reverse. 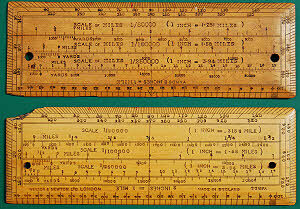 It is much wider than the normal type of six inch boxwood rectangular protractor. 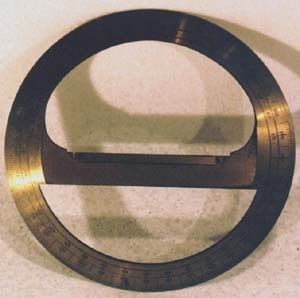 Hutchinson’s Stereographic Protractor for Circles 2.5 inches Radius. A celluloid rectangular protractor, 12” x 2.5”. Front has normal and stereographically projected angle scales top and bottom with instructions in the middle. Reverse has cm/mm and ¼ inch rulers and formulae. Arthur Hutchinson, FRS (1866-1937) was Emeritus Professor of Mineralogy at Cambridge University and Master of Pembroke College and invented (1908) and marketed the protractor. This one has “117 Moorgate, London Maker” on it which was the address of W H Harling. The stereographic projection was used in a variety of disciplines including cartography, mineralogy, and crystallography. 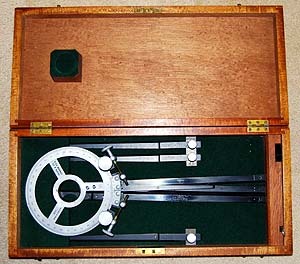 Folding arm vernier protractor by John Cail of Newcastle upon Tyne (working 1825-65). A six inch diameter brass protractor with inset silver scale and two silver verniers. The folding arms are supported by springs when extended and have protracting pins at their ends for accurate plotting. The protractor is adjusted by rotating a pinion which acts on a rack around the periphery of the instrument. These protractors were mainly sold for plotting theodolite readings. 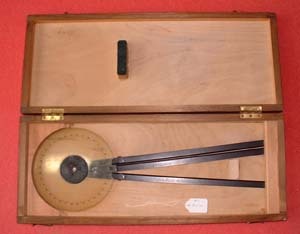 The protractor has a mahogany case and separate magnifier for reading the verniers. Heath & Co 6” circle station pointer, serial no. 5157, divided to ½ degree, with flush verniers reading to 1 minute and tangent screws for fine adjustment. 15” arms with extensions to 24”. Separate magnifier for reading the verniers. Wooden box with mahogany sides and plywood top and bottom, fitted and part lined with green felt. 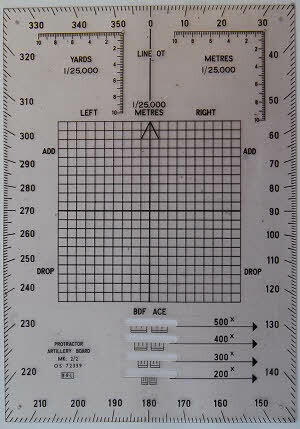 This is similar to the Admiralty Pattern station pointer shown in the 1958 W F Stanley catalogue except that it does not appear to be divided on brass or chrome plated. 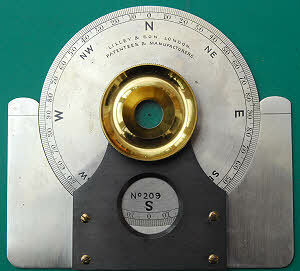 Heath & Co merged with Stanley in 1926, but the name was retained for navigational instruments. Nickel silver station pointer by Bottomley, 11 Billiter St., London, dating from 1878-88 when Bottomley was at that address. The bottom arm, which is signed, is missing its index. The magnifier is missing from its housing in the case. Four inch circle. Brass protractor by Robson, Newcastle upon Tyne, probably ca.1880. In addition to being graduated in degrees it has the four cardinal points marked on it, suggesting that it was for navigational use. Diameter 7.4 inches. Lechertier Barbe ivory, six inch, rectangular protractor, ca.1900. 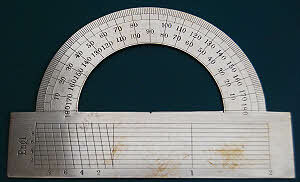 This is a typical protractor of the period. Two six inch rectangular protractors. The upper one, in ivory, is by Negretti & Zambra and dates from c1900. 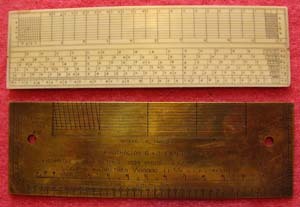 The lower, brass one is a British Army “A II Protractor 6” x 2” Exactly” dating from 1917 made by the Tone Engineering Co Ltd, Birmingham. Ivory protractor by Aston & Mander with military sketch-mapping scales on the reverse including “Yds 8 ins to 1 mile”; “Normal scale of slopes” and a table of “HE in Yds” columns “D, 15’, 20’” with the formula “HE = VI x 19.1/D”, where HE = Horizontal Equivalent, VI = Vertical Interval and D = Degree. 15’ & 20’ are contour intervals (VI) in feet. Aston & Mander 1917 Ltd. rectangular protractor, made of ivory, intended for use with English and continental maps, probably for use by an army officer. 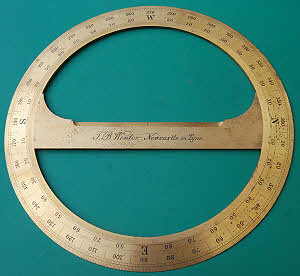 Aston & Mander made many items for the army and later for the RAF including various designs of rectangular protractor. 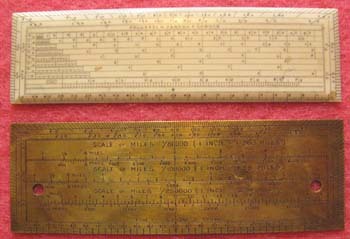 This version is quite similar to the 'Protractor Rectangular 6" x 2" Exactly AII' (see above), which was made for the army by several makers in a variety of materials including brass, boxwood and white celluloid. This Aston & Mander protractor, being ivory, would not have been army issue but probably purchased by the officer himself as officers had to purchase much of their own equipment. A nickel silver six inch protractor by the Dutch firm Ahrend, probably mid 20th century. The scales run from 350 to 190 degrees and 190 to 350. 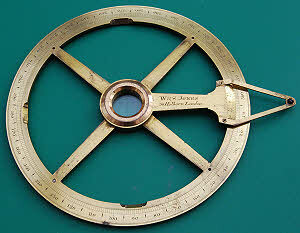 “Douglas” combined protractor and parallel rule, used for navigation. 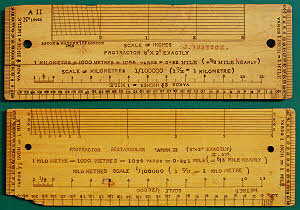 The protractor is celluloid and it is housed in a stout card case with the instructions pasted on the front and back. Designed by Rear Admiral H P Douglas RN and made by the London Nameplate Manufacturing Co Ltd in Brighton. Circular brass protractors by Dollond London and Stebbing Southampton. The Dollond one is 6” diameter, lacquered, and dates from ca. 1900. The Stebbing one is 8” diameter and dates from the second quarter of the 19th century; it was used by a ship’s navigator. Ivory combined six inch parallel rule and rectangular protractor signed J Archbutt, 20 Bridge Road, Lambeth. John Archbutt was working here from 1838 to 1864. 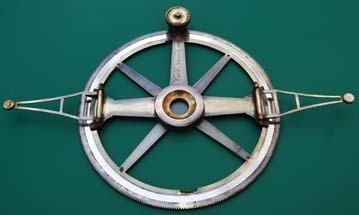 Folding six inch brass protractor by Blunt & Son dating from 1801-22. Blunt & Son was a partnership between Thomas Blunt and his son, also Thomas Blunt. 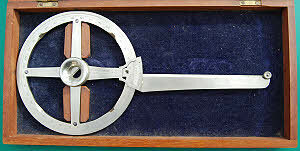 Six inch electrum vernier protractor by John Davis & Son of Derby. It has an unusually long arm. 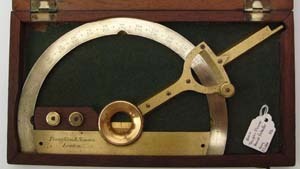 This six inch brass vernier protractor is signed W & S Jones, Holborn, London. It dates from about 1840 probably. It has a mahogany case. AII and AIII protractors compared. The AII (upper) was made by Aston & Mander in 1915 - they were made in celluloid, brass and boxwood by various makers and I have several examples as they were the standard British military protractor in World War I. The AIII was its replacement in the 1920s and is much less common. This example is signed Winsor & Newton. 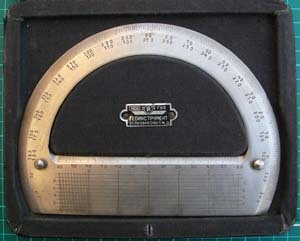 Protractor Rectangular 6 inch Ivorine A Mk IV. The A Mk IV was the last, special design of British military rectangular protractor. 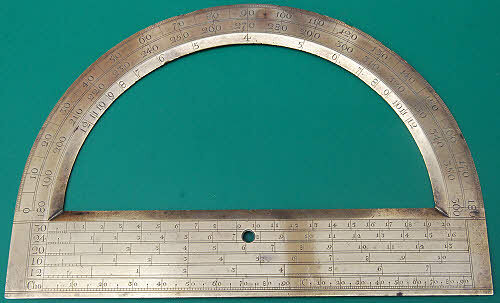 Later protractors were transparent and semi-circular. The earliest ones were reinforced in the ivorine with metal mesh and carried the patent number 361012/30 so it presumably replaced the AIII about 1930. Later ivorine ones were not reinforced and the one pictured above is one of those. The last ones made, including those made by Blundell Rules Ltd, were made of un-reinforced PVC and renamed Protractor Rectangular 6” Opaque ‘A’ Mk 4. The scales on one side, from top to bottom are: yards 1 inch = 1 mile; yards 1/4 inch = 1 mile; miles 1/4 inch = 1 mile; yards 1:20,000; metres 1/4 inch = 1 mile; metres 1 inch = 1 mile. On the other side below the protractor scales are: metres 1:80,000; metres 1:25,000; miles 1:250,000; yards 1:250,000; yards 1:50,000; yards 1:25,000. It remained in service long enough to acquire a NATO number W10 6675-99-445-2112. One in my collection had been re-packaged (in polythene) in December 1976. 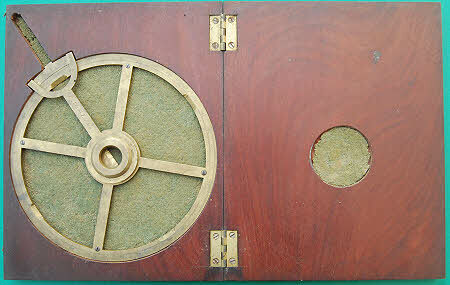 S & S Ltd 12” diameter, lacquered brass protractor and green baize lined mahogany case. Numerals and graduation to 10 minutes machine engraved. Probably ca.1950. Provenance - Royal Aircraft Establishment instrument 998. MOD catalogue number B.1980. 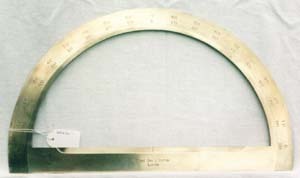 A thin brass protractor, 3.5 inches long with a three inch diagonal scale labelled ‘Engl’ to signify English inches. 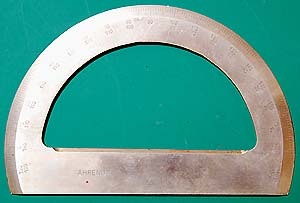 Protractor Rectangular A MkIII (6” x 2” Exactly). This is an Ivorine (Celluloid) example dating from the 1920s. A most unusual protractor signed “Lilley & Son London Patentee & Manufacturer No 209”. The inner brass part is knurled on the outside and is used to rotate the circular part of the protractor. The glazed centre has a centre mark and there are index marks to left and right near the top of the side arms of the static part. The circle is marked with eight cardinal points and is graduated for 0 to 90 degrees in each quadrant with graduations every 0.5 degrees. 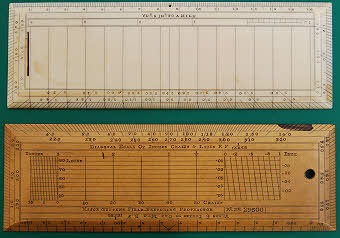 It is actually a Patent Chart Course Indicator intended for navigational chart work. Believed patented in 1883. It has a blue velvet lined, Morocco leather covered case. This large (8.4” long) brass, semi-circular protractor is beveled on both inside and outside edges. Besides the 0-180 and 180-360 x 1/2 degree scales it has a scale for 4 to 12 sided polygons on the inner face. There are also Cho and C (chord) scales and plain scales for 12, 16, 20, 24 & 30 (to the inch). Oblique shot to reduce shadows & reflections. Probably dates from 1780-1810. This thin brass protractor was made in Russia and has a 1:8400 diagonal scale on the base. The base is 6 1/4 inches long and has a reinforcing brass strip screwed to its bottom edge. This was possibly a later modification to stop the protractor sliding under a tee square or other supporting edge. Coincidentally the diagonal scale is actually in inches. Probably mid-20th century. 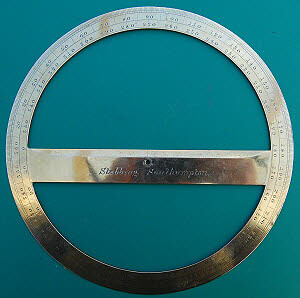 A 4 inch brass protractor (from a case of drawing instruments) signed Gilbert & Sons London. Gilbert & Sons were working from 1806-1819. 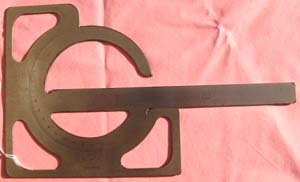 A 6” Vernier protractor made for the British government by S&S Ltd. 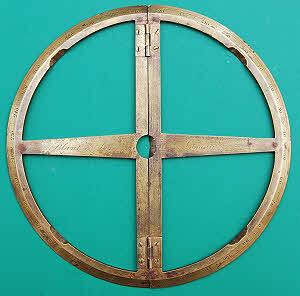 This heavy brass protractor is a close copy of the much earlier one made by Troughton & Simms (see above). It is housed in a fitted mahogany case. The separate magnifier and screw pins for holding it in place are missing. A 6” boxwood rectangular protractor signed Coombes Devonport. Unusually it has both inch and cm scales and both systems of diagonal scale. 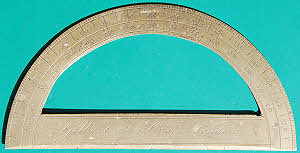 A combination 6” ivory rectangular protractor and rolling parallel rule dating from 1830-1850 period. The end fittings and rollers are electrum. On the upper side it has the usual degrees around three sides and 1/4” and 1/2” diagonal scales. 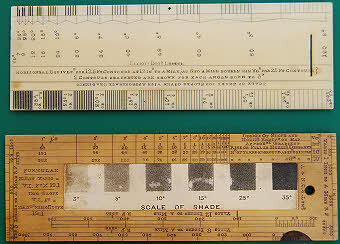 On the reverse are architect’s and surveyor’s scales (1/8, 1/4, 3/8, 1/2, 5/8, 3/4, 7/8, and 1”; 30, 35, 45, 50, 60 , C). Protractor artillery board Mk 2/2 OS72339 made by Blundell Rules Ltd, probably in the 1950s. 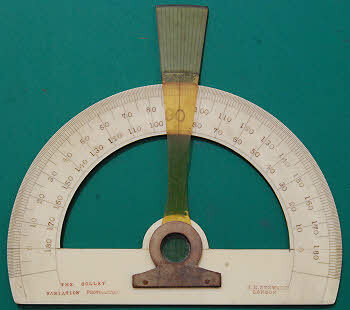 This celluloid protractor measures 5.1 x 7.4 inches. It has a green cloth covered hard case marked with the numbers OS4622A and OS32832. Ivory 6” rectangular protractor signed Is Simons Mary le Bone Street London. James Simons was working there from 1771 to 1794. “The Colley Variation Protractor” by J H Steward. 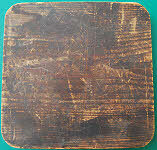 The semi-circle is 6” across and the main material is celluloid. The end of the swing arm has lines on it at 1 degree intervals for the magnetic variation. Col. W Verners Complete Sketcher no.603 made by J H Steward, 406 Strand, London about the time of WWI. It combines the functions of protractor, magnetic compass, rule, alidade and clinometer. Regrettably the compass card has been replaced at some time with a crude, homemade? one. Verner originally patented it in the 19th century when he was Capt. Verner and versions exist with him as Capt., Major, Lieut. Col. and Col. Verner. On early versions the alidade does not extend. It’s a military sketching protractor, and an officer’s personal property. 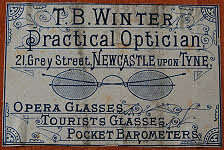 Ten inch lacquered brass protractor by T B Winter, 21 Grey Street, Newcastle on Tyne. The trade label is inside the lid of the fitted wood case. It is a navigational protractor with the four cardinal points shown, a 0 - 360 degree scale, and four 0 - 90 degree scales in the quarters. Late 19th century.